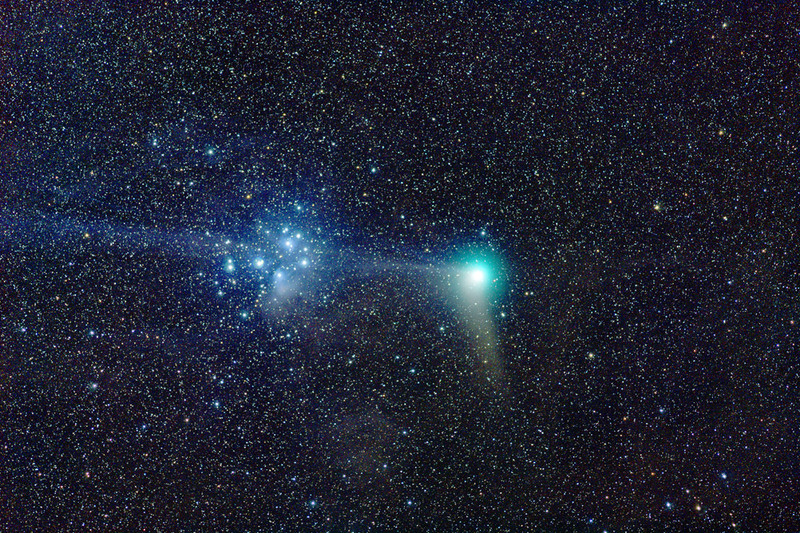 Description Although already pretty low in the evening northern sky, this comet put on a nice show when it encountered the Pleiades and merged its ion tail with their nebulosity. The much shorter reddish dust tail is also prominent. Towards the bottom and just left of center is the reflection nebula IC 341. The field is about 10 x 7 degrees wide with north towards the top. Exposure RGB 5:5:5 min @ -20°C - 2x2 - all exposures 60 s.
Camera SBIG STL-11000 with Astronomik Type II filter set.